Welcome to our Nintendo Switch Super Smash Bros Ultimate Pokemon List, here you can view all the New Pokemon in SSBU you can use in battle from throwing a Pokeball or Master Ball. Super Smash Bros Ultimate New Pokemon List, here you can view all the NEW Pokeball Pokemon joining the franchise in SSBU. 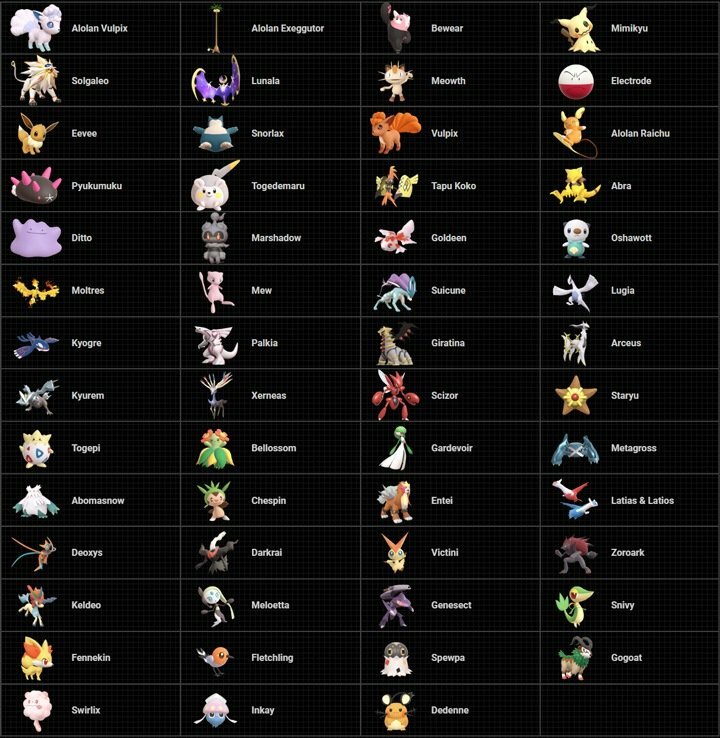 The descriptions for each of the new pokemon are from the Super Smash Blog. Abra Abra will ensnare a nearby fighter and teleport them to a random position on or even off the stage. Bewear Bewear’s more ferocious than it looks, with slow movement speed offset by very powerful attacks. Ditto Ditto will transform into the fighter who threw the Poké Ball when joining the fight. After the transformation, Ditto will have the exact same abilities as the original fighter! Alolan Exeggutor It may seem like it just gets in the way, but it can actually make it harder or easier for you to get a KO depending on where it’s placed on the stage. Marshadow This Pokémon can hide in the shadows. When it finds its target, it will emerge from the shadows and deal a powerful punch! When there are multiple opponents, it may change its target between punches. Mimikyu Mimikyu drags a nearby opponent under its rag and attacks them! The opponent cannot move while captured by Mimikyu, and if they end up with more than 100% damage after the attack, they’ll be instantly KO’d. Alolan Raichu He rides his tail and rushes the enemy. Since he moves freely around the stage, Alolan Racihu may be a bit difficult to dodge. Solgaleo If this Pokémon hits you as it charges back and forth across the stage, you’ll take serious damage! Togedemaru This Pokémon shoots sparks from its body. You’ll take severe damage if they hit you, so we recommend keeping your distance. Alolan Vulpix This Pokémon freezes fighters with icy breath. Lunala This Pokémon shoots a powerful light beam through the stage!